Each day morning demands something new and refreshing to keep you going the whole day.But an unhealthy breakfast is equivalent to starving and increases loads on your fat.Kids are the main pranky ones with whom its very difficult to satisfy all nutritional demands; some don't like milk,some don't want chapathis,some may not eat hard boiled eggs,some may not like bread and so on.I too have two of them here,and so I always have to find newer ways not only for kids but also for us too..And a breakfast,I truly desire is a very healthy one that can give us the required good calories.And so in search of a healthy breakfast,I found this and its easy to prepare the previous day for working moms and also I think meets many of the nutritional aspects.Cottage cheese,eggs,mushroms,whole wheat,butterless,sugarless,very less oil and what else do you wish for a perfect breakfast?? Yes..A true healthy one !!! At first,my kids were very reluctant to eat them by the looks but then when they tasted it ...aha..it tastes egg..hmm,they like scrambled eggs,so they were happy to find the similar taste in these muffins(as the flour content is just 1/4cup).They just competed one another and gobbled up.My hubby too like this idea of sneaking cottage cheese,eggs,mushrooms,wheat flour all in one go.And above all,my work became quite easier to just scoop and bake.So friends,enjoy the delicious breakfast muffins or as tea time snack!! -Wash the mushrooms and pat dry the water on a paper towel.Dice the mushroms ,keep side. 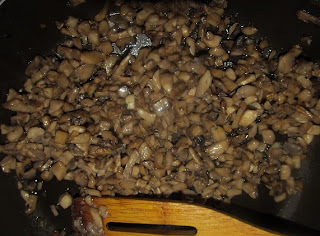 -Heat 2tsp of oil in a pan and add mushrooms to it.Saute till the water evaporates and the mushrooms turn brown, cooked.Put off the flame and let it cool down. -Sift the wheat flour ,add the baking powder,salt,spices. -Wash and chop the parsley leaves.Shred the cottage cheese and mix parmesan cheese.Add this to the dry ingredients.Add the cooked mushrooms. 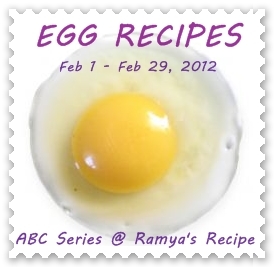 -Beat the eggs and mix it to the other ingredients .Add the water to adjust the batter consistency. -Pre heat oven to 400 degrees F and line the muffin pan with paper liners and spray with oil or butter. 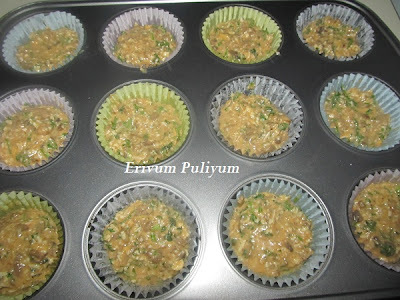 -Scoop the batter into each cup and place it in the oven, bake for 25 minutes. * You can add basil leaves instead of parsley leaves. * You can use any spices of your choice.Add cayenne pepper in place of chilli powder. 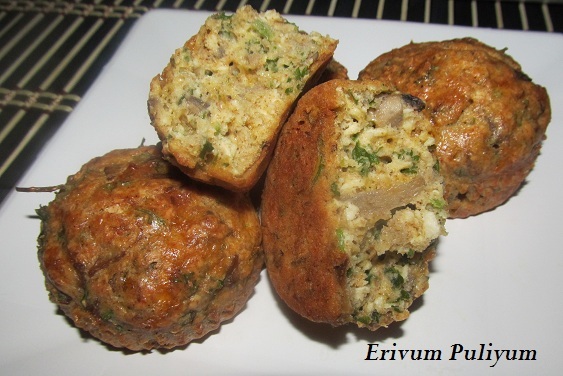 So,Stay tuned to Erivum Puliyum till we meet next with a new recipe ! Looks healthy and delicious...I like all the ingredients in them! This is a such a healthy breakfast dear, with the mushrooms, paneer and cheese, shud've been tasty too..
Lovely breakfast,I'm sure gonna try this. 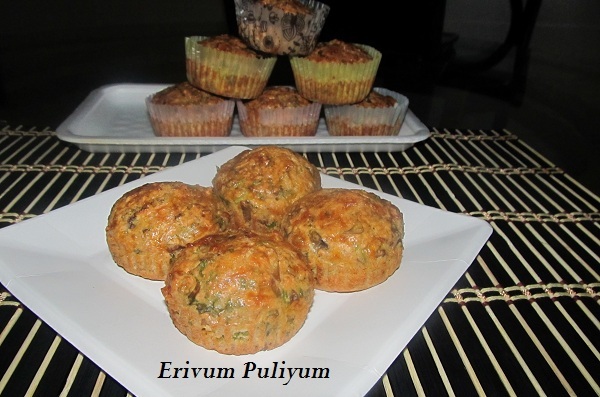 Wow...healthy n interesting muffin recipe,a yummy n filling breakfast!! 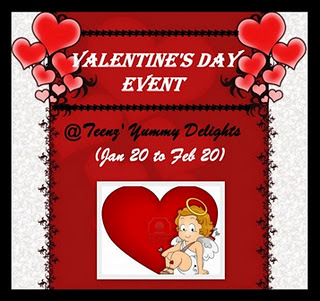 Thanks for linking it to the event!! These look so delicious. I have been planning since few days to make these but somehow never did. They make such perfect breakfast and I love them with a hot cup of coffee during winters. healthy and perfect for bkfast!! 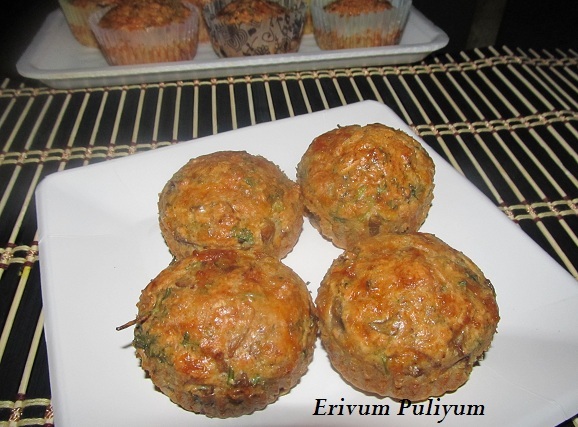 wow never made savory muffins must try and healthy too! 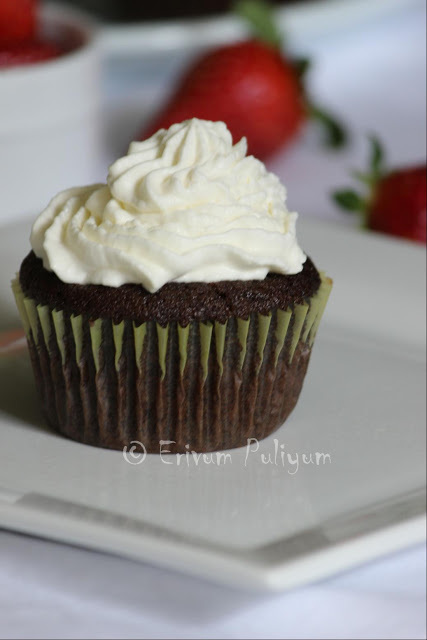 wow these muffins luk so cute...simply delicious !!!!! Julie! first time come across this recipe. 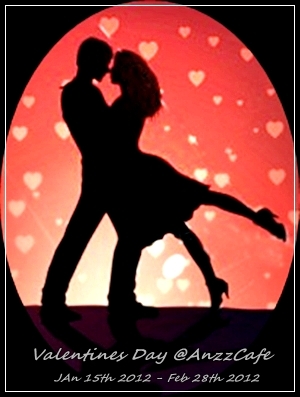 look worth to try! wow!! Julie..what a perfect treat for breakfast...yummy yummy..
Wow wat a super great looking muffins..stunning and delicious. 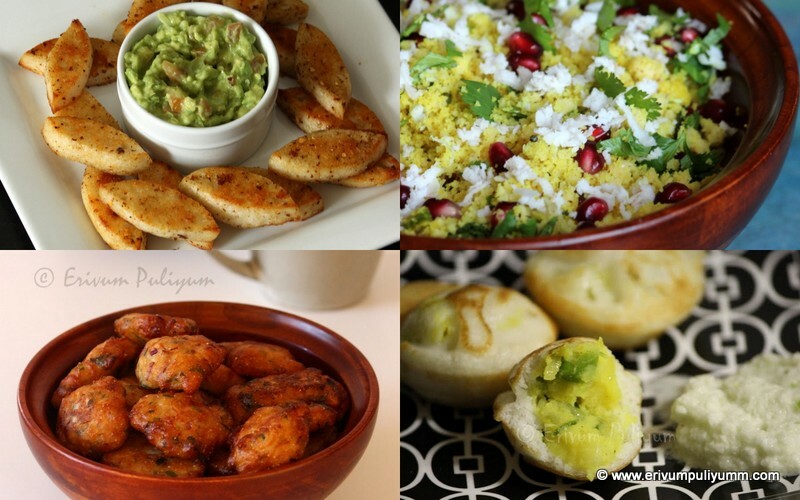 This is a must try; love savoury! Brilliant idea Julie..I loved it and bookmarked! Thanks. these are EXCELLENT.....perfect for breakfast. 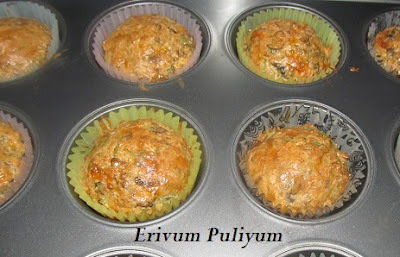 Very new to me Dear.ice Idea for Breakfast.Muffins Luk yumm n drool-worthy really. wow! this recipe looks awesome.Thanks for visiting my blog,following you. Muffins look yummy! Nice idea Julie! 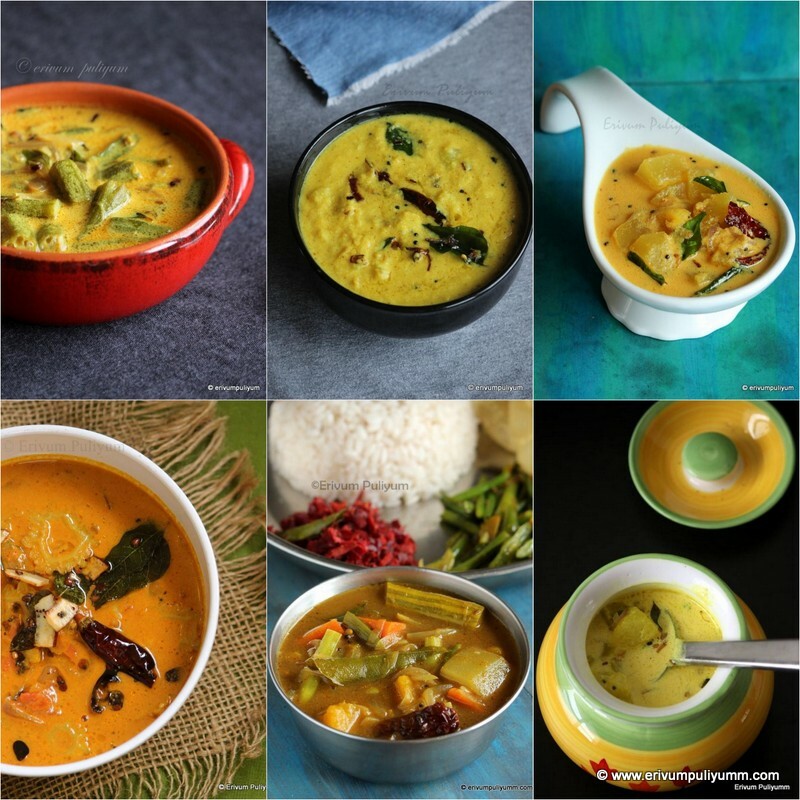 wow seems very tasty and healthy one..good clicks.. Very creative and healthy muffins. No wonder your kids liked to gorge on them. what a great idea for muffins!